The tour started out at Carleton University on Saturday morning. We were up bright and early and arrived to check our luggage (which was being trucked to Kemptville) and have a bite to eat. There were approximately 600 riders, so riders start in groups of about 50, approximately 10 minutes apart. We wanted to leave fairly early because day 1 consisted of 85km or so to Kemptville, followed by a loop out of town and back of about 35km. To start the loop, we had to be in Kemptville by the cutoff time of 1:30pm. We managed to be in the second start group and followed the group leaders up Prince of Wales and out of town. 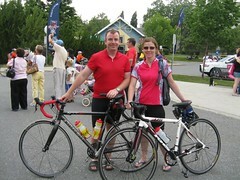 The tour was fully supported, with rest stops approximately every 15km. We usually stopped, but not for very long. Each rest stop had a few porta-potties, snacks like fruit and cookies and water. The last rest stop before Kemtpville College had home-made chocolate chip cookies which were delicious! 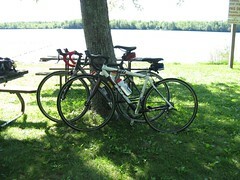 Lunch was at Rideau River Provincial Park, which was about 55km from Ottawa. We got there at about 10:40, which was a bit early for lunch, but we were quite hungry by then! The weather couldn’t have been better on Saturday, so we enjoyed our BBQ’d lunch and salads at a picnic table by the river. As we ate, the riders were rolling in. We were on our way around 11:20am to follow the long route to Kemtpville. After a couple more rest stops, including the one with the delicious cookies, and we arrived at Kemptville Collage around 12:30pm, with plenty of time to spare before the cut off time. We went back out and started the 35km loop which brought us over the 416 and then back along some rural roads. There was a bit of a headwind on some of the roads so we were a bit slower on the loop. It seemed like few cyclists opt to do the loop as we only saw one other cyclists while we were out there. We made it back to the college by 2:20pm after having cycled more in one day than we ever had before. At the college, we checked our bikes and went to set up our tent. There are also dorm accommodations, but we signed up a little late and missed out on those. After a shower and a change of clothes we headed to the corn roast and had some ice cream. Then it was time for a quick and free massage … so good!! Just what my shoulders needed. We met up with some friends, Bonnie and Grant, who cycled with their kids on tow (2 on trail-a-bikes and one in a trailer) and headed into the beer garden to enjoy some well-deserved beer. After dinner there were ceremonies and awards (for top fundraiser, best team name, etc.). Three people had raised of $10,000 each…incredible! We headed to bed exhausted after a long day and woke up early Sunday morning to head back to Ottawa. On Sunday, everyone does the same short route to Ottawa, which is about 65km. We headed out of Kemptville around 8:15am or so in a bit of light rain. We out-biked the rain after about 30 min and headed into some sunshine which was lovely. The wind was at our backs for much of the ride, which was great because the few times we had to bike into it, it was awful! Again, we stopped at most rest stops for a short break and to rest our weary behinds. We arrived back at Carleton at 11:15am and enjoyed a nice lunch before packing up the car and heading home for a shower. Together, Dave and I raised $985, and of that I raised $660. Thank you to everyone who contributed! In total, we did 187km in 7h and 20min, at an average speed of 25.4 km/h. All in all it was a great event and we hope to do it again next year!